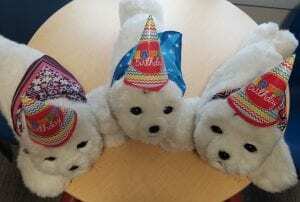 Paro and Gato, Northern Light Acadia Hospital’s robotic therapeutic seals, are celebrating their fourth birthday today! They’re celebrating their special day with their new friend, Lily. These seals have been an incredible addition to Acadia Hospital’s Pediatric team since arriving in Bangor. They provide comfort and companionship to hundreds of our young patients. All the way from Japan, Paro and Gato were purchased using Children’s Miracle Network Hospitals funds raised locally throughout central, eastern, and northern Maine!